And a’ll last for many a year. On a recent trip to London, I had an extra day free, and decided to visit the Uffington White Horse with a friend. 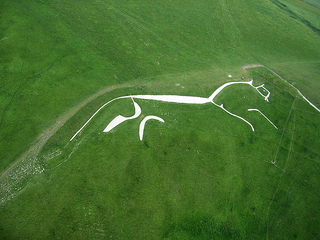 The Uffington White Horse is one of the most mysterious human artifacts on the planet. In the south of Oxfordshire, less than two hours west of London by Zipcar, it sits atop White Horse Hill in the Vale of White Horse to which it gives its name. It is the oldest of the English chalk figures, which are constructed by removing turf and topsoil to reveal the chalk layer below. The figure is sui generis in its magnificence, far surpassing any of the other hill figures extant in England. The surrounding landscape — with its steep hills, the neighboring Roman earthworks castle, and pastoral lands still used for grazing sheep and cows — is spectacular. The Uffington horse is probably best known for its appearance in Thomas Hughes’s 1857 novel Tom Brown’s Schooldays. The protagonist Tom Brown, like Hughes himself, hails from Uffington, and Hughes uses that fact as an excuse to spend a few pages detailing the then-prevalent theory of the origin of the figure, proposed by Francis Wise in 1738, that the figure was carved into the hill in honor of King Æthelred’s victory over the Danes there in 871. As it turns out, in a triumph of science over legend, Oxford archaeologists have dated the horse more accurately within the last twenty years. They conclude that the trenches were originally dug some time between 1400 and 600 BCE, making the figure about three millennia old. How did the figure get preserved over this incredible expanse of time? The longevity of the horse is especially remarkable given its construction. The construction method is a bit different from its popular presentation as a kind of huge shallow intaglio, revealing the chalk substrate. Instead it is constructed as a set of trenches dug several feet deep and backfilled with chalk. Nonetheless, over time, dirt will overfill the chalk areas and grass will encroach. Over a period of decades, this process leads chalk figures to become “lost”. In fact, several lost chalk figures in England are known of. 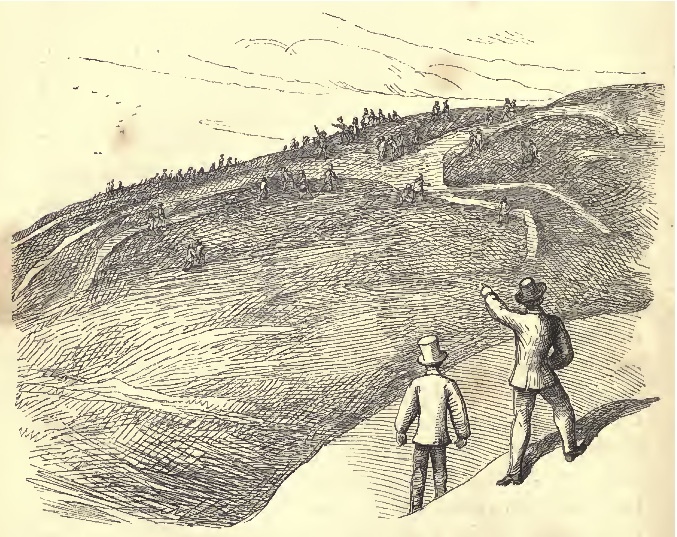 Figure from Hughes’s The Scouring of the White Horse depicting the 1857 scouring. From the 1859 Macmillan edition. This “repairing and cleansing” has been traditionally accomplished through semi-regular celebrations, called scourings, occurring at approximately decade intervals, in which the locals came together in a festival atmosphere to clean and repair the chalk lines, at the same time participating in competitions, games, and apparently much beer. Hughes’s 1859 book The Scouring of the White Horse is a fictionalized recounting of the 1857 scouring that he attended. These days, the regular maintenance of the figure has been taken over by the National Trust, which has also arranged for repair of vandalism damage and even for camouflaging of the figure during World War II. 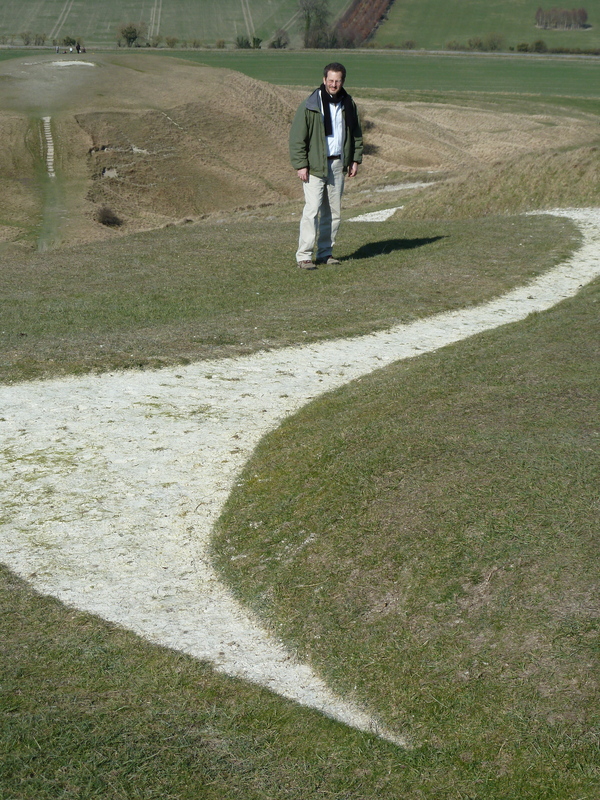 The author at the Uffington White Horse, 19 March 2011, with Dragon Hill in the background. Note the beginnings of plant growth on the chalk substrate. Thus, the survival of the Uffington White Horse is witness to a continuous three millennium process of active maintenance of this artifact. As such, it provides a perfect metaphor for the problems of digital preservation. (Ah, finally, I get to the connection with the topic at hand.) We have no precedent for long-term preservation of interpretable digital objects. Unlike books printed on acid-free paper, which survive quite well in a context of benign neglect, but quite like the White Horse, bits degrade over time. It requires a constant process of maintenance and repair — mirroring, verification, correction, format migration — to maintain interpretable bits over time scales longer than technology-change cycles. By coincidence, those time scales are about commensurate with the time scales for chalk figure loss, on the order of decades. The tale of the Uffington White Horse provides some happy evidence that humanity can, when sufficiently motivated to establish appropriate institutions, maintain this kind of active process over millennia, but also serves as a reminder of the kind of loss we might see in the absence of such a process. The figure is to my knowledge the oldest extant human artifact that has survived due to continual maintenance. In recognition of this, I propose that we adopt as an appropriate term for the regular processes of digital preservation “the scouring of the White Horse”. Francis Wise, A Letter to Dr. Mead concerning some antiquities in Berkshire; Particularly shewing that the White Horse, which gives name to the Vale, is a Monument of the West Saxons, made in memory of great Victory obtained over the Danes A.D. 871, 1758. David Miles and Simon Palmer, “White Horse Hill,” Current Archaeology, volume 142, pages 372-378, 1995. Thomas Baskerville, The Description of Towns, on the Road from Faringdon to Bristow and Other Places, 1681. One of the salutary byproducts of the recent mass book digitization efforts is the open availability of digital versions of both Hughes books: through Open Library and Google Books. Interestingly, the Uffington White Horse has been “mirrored” as well, with replicas in Hogansville, GA, Juarez, Mexico, and Canberra, Australia. Thank you for bringing attention to this. I think it’s incredible that people can remain committed to maintaining something like this for thousands of years. With how rapidly things are changing now it’s nice to see something that stays the same (both the horse and the attitude of the people who have maintained it).